Achieve your vision within budget constraints with Protean’s ACM panels. ACM composite panel systems provide a sharp aesthetic at the lowest cost when a faster return on investment is essential. ACM panels are best used in low rise applications above grade and are ideal for retail and multi-family buildings. Protean’s ACM panels offer a sharp aesthetic that is cost effective for buildings needing frequent upgrades due to branding and turnover. ACM-100 panels met The Lakes, Lakefront Residences’ need for an elegant exterior without pushing rental costs beyond the means of the targeted demographic. Protean’s most economical rainscreen cladding system, ACM-2000RS can be installed as a drained/back-ventilated system or modified to install as a pressure equalized rainscreen system. 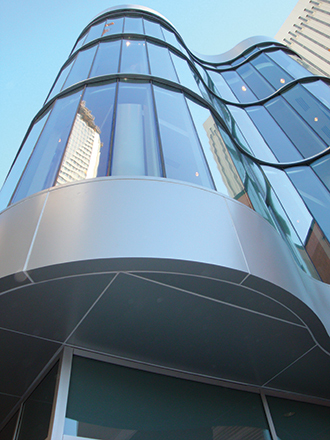 ACM rainscreen cladding can be custom painted to match or contrast with other materials if desired on larger projects. An extruded frame rainscreen panel system, ACM-3000RS is engineered for extremely wet climates or for buildings exposed to driving rain. ACM-3000RS is designed to reduce the risk of moisture seeping behind the panels due to joint splines not found in more economical rainscreens. The extruded frame and non-welded corners provide a crisp and clean edge for an improved aesthetic. 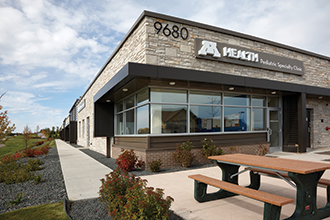 ACM-3000RS, an extruded frame ACM rainscreen cladding system, created a sharp aesthetic for the Woodbury Medical Office Complex. This spline joint system provided crisp returns with no reveals for minimal maintenance and enhanced protection from open exposure. 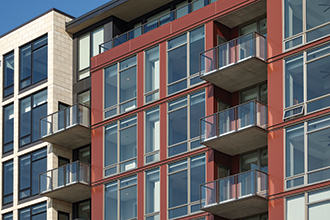 ACM-100 composite panel systems provide a sharp look at a competitive price ideal for retail, commercial or multi-family buildings, especially where branding and turnover result in frequent renovation. The architect of North Carolina’s Knight Theater wanted the contemporary look of ACM along with its economic advantages, but needed a bold presentation. Protean designed a project specific solution by forming the ACM-100 panels to achieve the architect’s vision and by keeping within budget constraints.